I do actually believe in signs. In 2013 I left MagicTheatre, a Nonprofit arts full time with benefits job in sf during our still on going job and housing crisis. Everyone was shocked but I had to give being a full time artist a try. I did. It was a lot harder than I thought and even though I was getting all the great gigs and getting paid and grants and had little side jobs at bookstores, little theatres, scavenger hunts, it was never enough to survive in this expensive city. So I decided to give up and get a full time job again, I thought, I’ll again put art on the side and get a full time job. But no one would hire me. No one. So I kept trying to be a full time artists and kept trying to get a full time job. And every month, I was barely paying my rent. After eons of applying I was about to lose everything so I got this job as a janitor to make ends meet. On my first day, I saw this sign, right next to the building where my new janitor job was, it seemed like a symbol of fitting doom. But this job helped me survive. It gave me the flexibility to keep being an artist. I was never ashamed even when my own friends looked down on me. “Didn’t you go to college?” “Janitor? Are you joking? Ew.” I’ve never been afraid of hard work. Didn’t give up. After nine months of working as a janitor, and seeing that Dead End sign, every day, I kept applying and applied for a nicer job that I did not think I was going to get, and GOT IT!. Yesterday Friday August 28 2015 was my last day at janitor job. I hugged and thanked my soon to be former boss (cause he is lovely) and said see you around. Left the place, looked at this sign. Took a picture. Blew it a kiss and walked away. 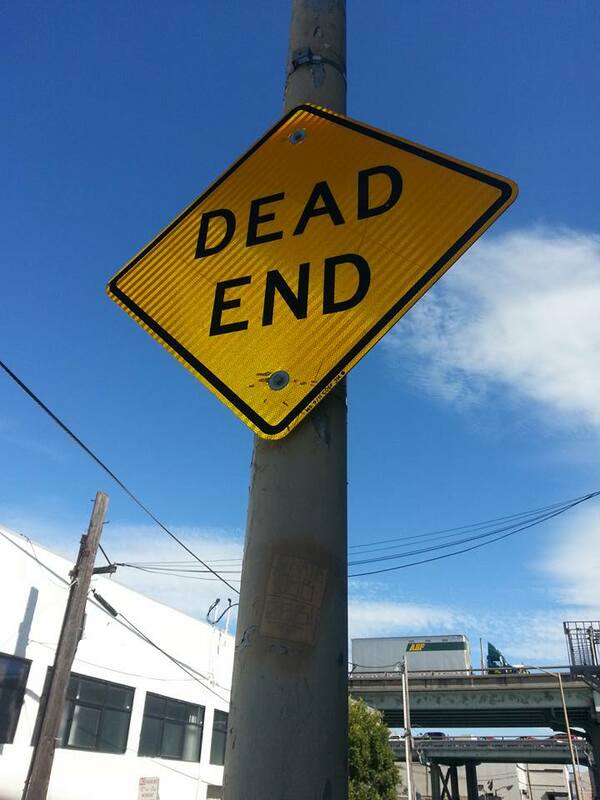 It is never a dead end you guys. I start my new job next week.